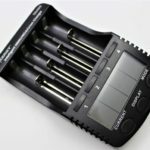 There are lots of battery chargers out there! Although functions are pretty similar across the brands, they obviously differ in execution. 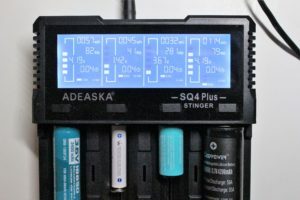 Today, I’m reviewing the Adeaska SQ4 Plus, which has a distinctively different display, and can charge up to a FULL 2000mA. 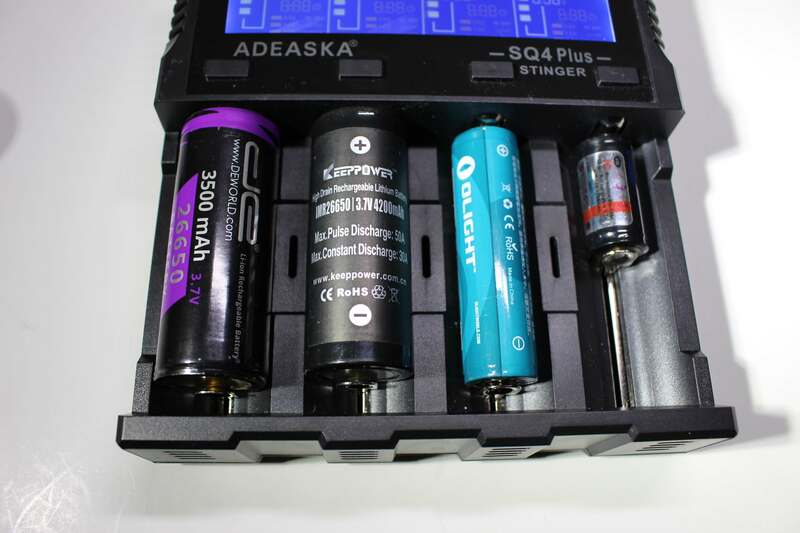 So within the rather large box that the SQ4 comes in (which has the same colors and lettering as a Nitecore charger would) you’ll find the unit, along with an instruction manual, and the two-sectioned power adapter. 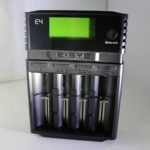 Representing battery types; IMR/Li-Ion/LiFePO4…. 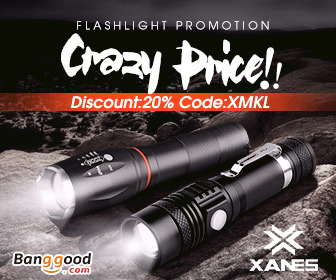 sizes include 10440, 14500, 16340, 18350, 18650, and 26650. For NiMH and NiCd, sizes include AAA, AA, C and D.
Four Slots; But Which One Does Which? 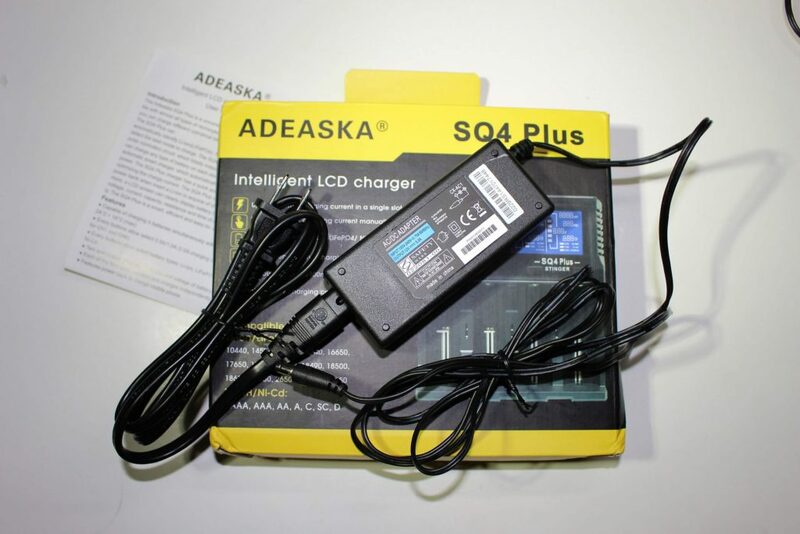 The Adeaska SQ4 offers three charging currents; 500mA, 1000mA, and 2000mA. 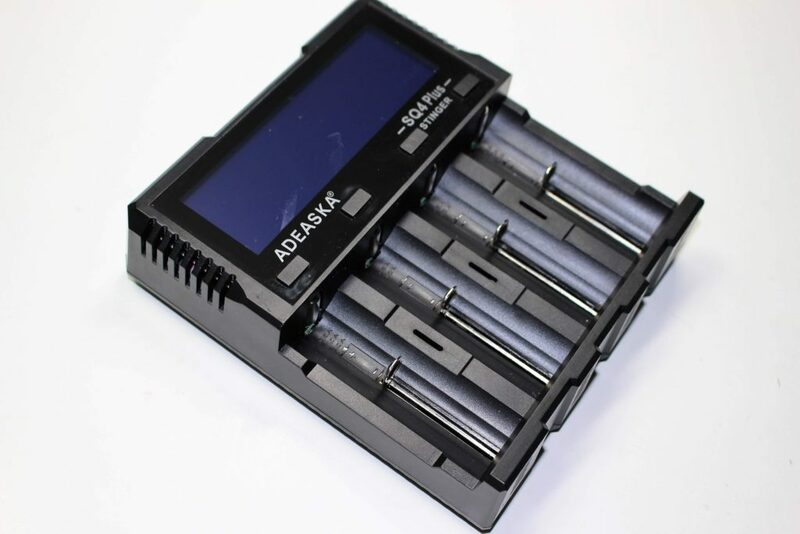 The slowest rate is the default for NiMH/NiCd batteries and is available in all four bays. 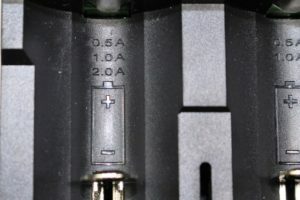 The charging rate of other battery types can be set manually, or, at the discretion of the unit. 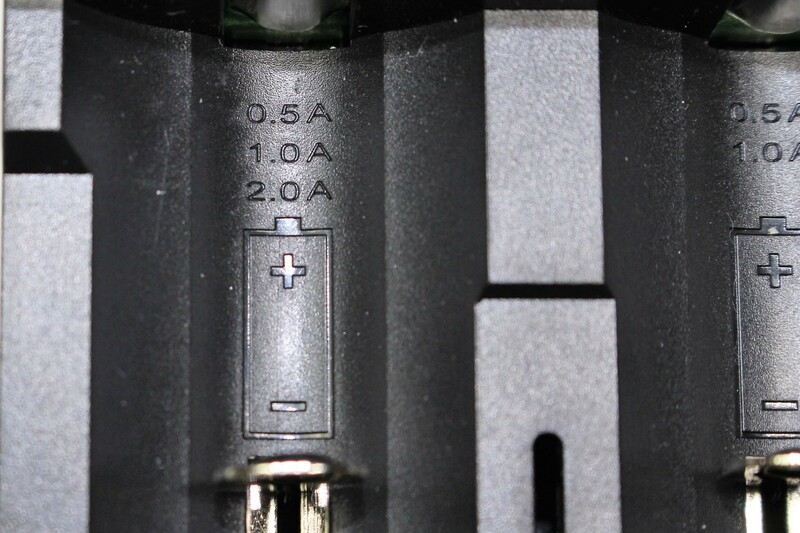 As for the faster charging currents; 2000mA (2A) is available in slots 1 & 4 only. 1000mA (1A) is for slots 2 & 3 only. 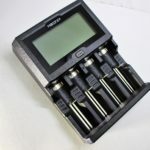 Please note that NiMH batteries can ONLY charge at 0.5v and CANNOT be changed manually, regardless of which slot they’re in. 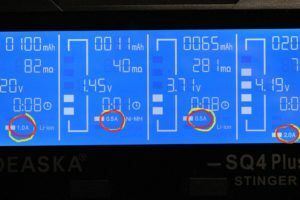 When a charge completes, the “mAh” reading on the display toggles automatically between total milliamp hours (mAh) accepted, and “FULL”. 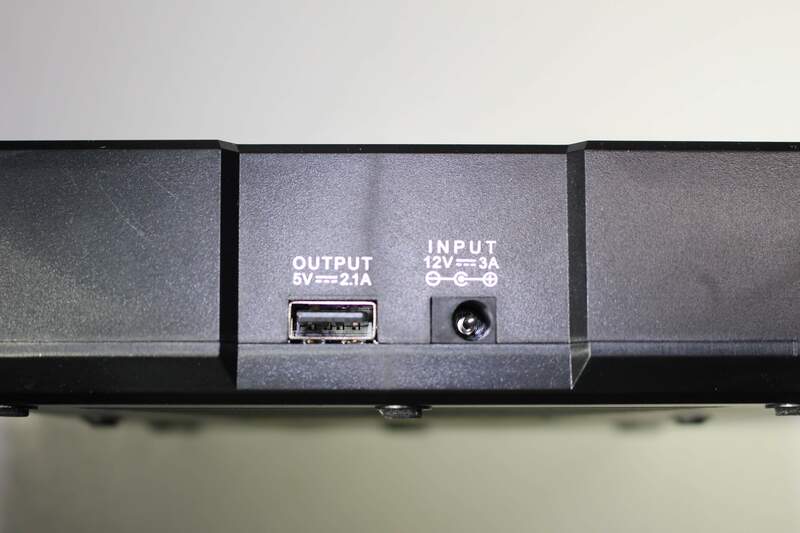 By connecting a USB cable, the SQ4 acts as a power bank. Of course it needs a fully charged 18650 placed into one of the slots, to provide the necessary juice. The charger does NOT require an AC connection to perform this task. 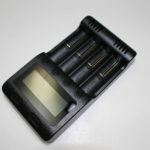 Subsequently, you can also check the power status of a battery anytime, by merely placing it into a slot. 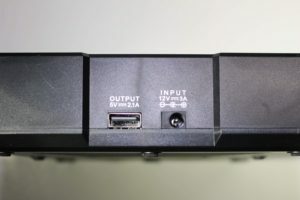 Within a few seconds, the square boxes on the left will indicate the state of charge. For example, on a 16340, two boxes indicate about 3.7 volts. The function does not work with NiMH/NiCd. 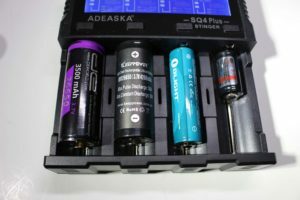 With the Zero Activation feature, the SQ4 should be able to revive most batteries that might otherwise not accept a charge. 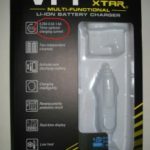 If a battery CANNOT be revived, the display will read “NULL” and will not be charged. There’s also an Overtime Prevention feature. This is based on the health of the battery. 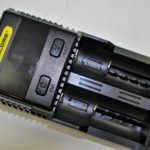 If it’s charging, but not very well, and ultimately taking longer to charge than most batteries, the unit will sense that and TERMINATE the charge if it’s been TEN HOURS since it began. This is a good function, however it should be noted that it’ll read “FULL” after it halts the charge. The problem is, the battery is likely NOT full, and if you weren’t paying attention, or don’t notice the elapsed time, you could mistake it for a legitimately full battery! 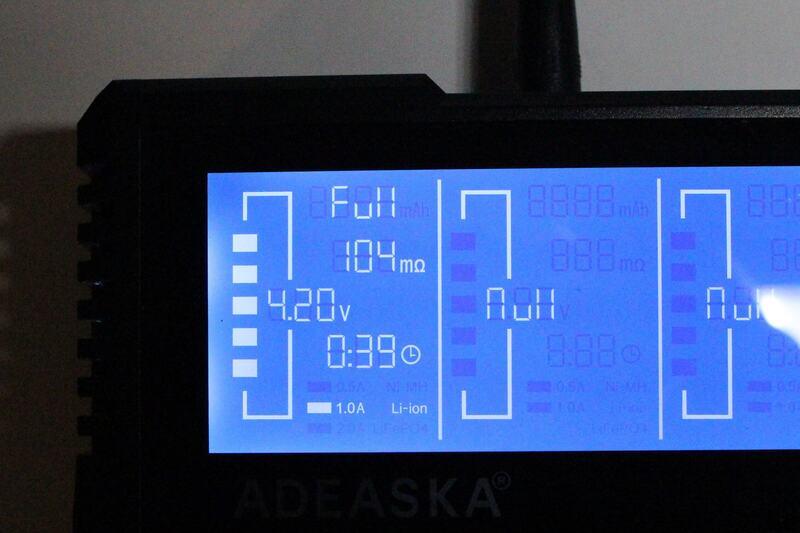 A fully charged lithium-ion battery always reads “4.20v” in the display, even if the “actual” voltage terminates somewhere below that. 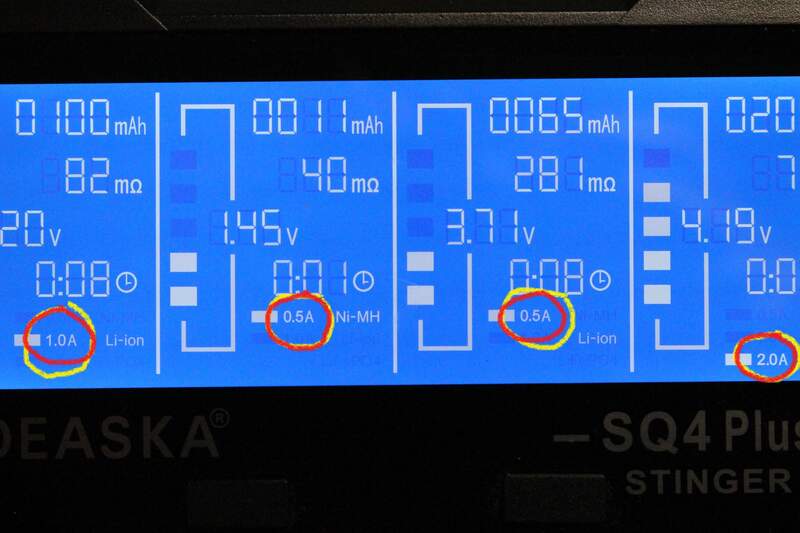 If you MUST know the real voltage, you’ll need to test the battery with a voltmeter afterwards. Do I Like the Adeaska SQ4 Plus? Never forget which cell goes where! 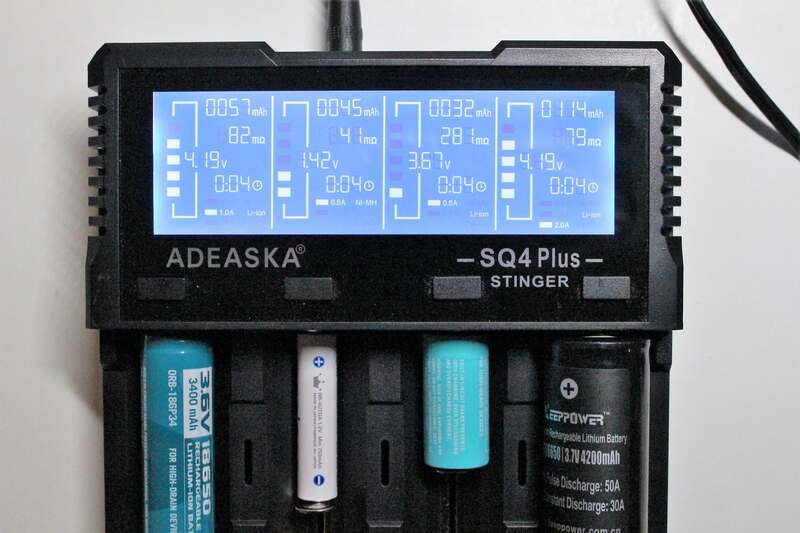 So, if the Adeaska SQ4 Plus, appeals to YOU, then I recommend you click here!